The deaf and hard of hearing have less intuition with sound but are no strangers to the effects of pressure, vibrations, and other basic acoustical principles. 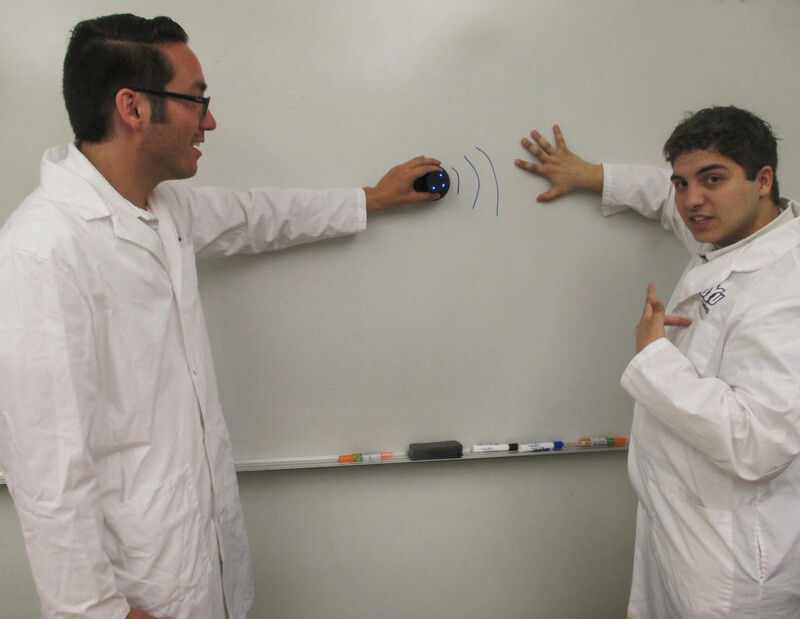 Brigham Young University recently expanded their “Sounds to Astound” outreach program (sounds.byu.edu) and developed an acoustics demonstration program for visiting deaf students. The program was designed to help the students connect to a wide variety of acoustical principles through highly visual and kinesthetic demonstrations of sound as well as utilizing the students’ primary language of American Sign Language (ASL). In science education, the “Hear and See” methodology (Beauchamp 2005) has been shown to be an effective teaching tool in assisting students to internalize new concepts. This sensory-focused approach can be applied to a deaf audience in a different way, the “See and Feel” method. In both, whenever possible students participate in demonstrations to experience the physical principle being taught. Two bilingual teaching approaches were tried to make ASL the primary instruction language while also enabling communication among the demonstrators. In the first approach, the presenter used ASL and spoken English simultaneously. In the second approach, the presenter used only ASL and other interpreters provided the spoken English translation. The second approach proved to be more effective for both the audience and the presenters because it allowed the presenter to focus on describing the principles in the native framework of ASL, resulting in a better presentation flow for the deaf students. In addition to the tabletop demonstrations (illustrated in the figures), the students were also able to feel sound in BYU’s reverberation chamber as a large subwoofer was operated at resonance frequencies of the room. The students were invited to walk around the room to find where the vibrations felt weakest. In doing so, the students mapped the nodal lines of the wave patterns in the room. In addition, the participants enjoyed standing in the corners of the room, where the sound pressure is eight times as strong and feeling the power of sound vibrations. The experience of sharing acoustics with the deaf and hard of hearing has been remarkable. We have learned a few lessons about what does and doesn’t work well with regards to the ASL communication, visual instruction, and accessibility of the demos to all participants. Clear ASL communication is key to the success of the event. As described above, it is more effective if the main presenter communicates with ASL and someone else, who understands ASL and physics, provides a verbal interpretation for non-ASL volunteers. Having a fair ratio of interpreters to participants gives individualized voices for each person in attendance throughout the event. Another important consideration is that the ASL presenter needs to be visible to all students at all times. Extra thought is required to illuminate the presenter when the demonstrations require low lighting for maximum visual effect. Because most of the demonstration traditionally rely on the perception of sound, care must be taken to provide visual instruction about the vibrations for hearing-impaired participants. (Lang 1973, 1981) This required the presenters to think creatively about how to modify demos. Dividing students into smaller groups (3-4 students) allow each student to interact with the demonstrations more closely. (Vongsawad 2014) This hands-on approach will improve the students’ ability to “See & Feel” the principles of sound being illustrated in the demonstrations and benefit more fully from the event. While a bit hesitant at first, by the end of the event, students were participating more freely, asking questions and excited about what they had learned. They left with a better understanding of principles of acoustics and how sound affects their lives. The primary benefit, however, was providing opportunities for deaf children to see that resources exist at universities for them to succeed in higher education. We would like to acknowledge support for this work from a National Science Foundation Grant (IIS-1124548) and from the Sorensen Impact Foundation. The visiting students also took part in a research project to develop a technology referred to as “Signglasses” – head-mounted artificial reality displays that could be used to help deaf and hard of hearing students better participate in planetarium shows. We also appreciate the support from the Acoustical Society of America in the development of BYU’s student chapter outreach program, “Sounds to Astound.” This work could not have been completed without the help of the Jean Massieu School of the Deaf in Salt Lake City, Utah. This video demonstrates the use of ASL as the primary means of communication for students. Communication in their native language improved understanding. 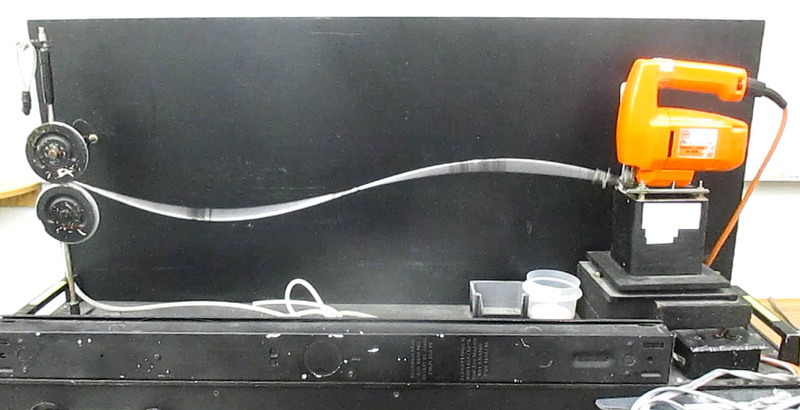 Figure 1: Vibrations on a string were made to appear “frozen” in time by matching the frequency of a strobe light to the frequency of oscillation, which enhanced the ability of students to analyze the wave properties visually. Figure 2: The Rubens Tube is another classic physics and acoustics demonstration to show resonance in a pipe. 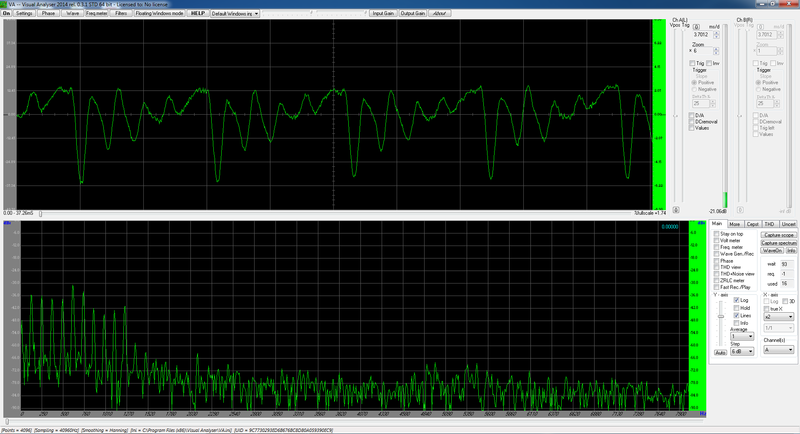 Similarly to the vibrations on a string, but this time being affected by sound waves directly. A speaker is attached to the end of a tube full of propane and the exiting propane that is lit on fire shows the variations in pressure due to the pressure wave caused by the sound in the tube. Here students are able to visualize a variety of sound properties. Figure 3: Free spectrum analyzer and oscilloscope software was used to visualize the properties of sound broken up into its derivative parts. Students were encouraged to make sounds by clapping, snapping, using a tuning fork or their voice, and were able to see that sounds made in different ways have different features. It was significant for the hearing-impaired students to see that the noises they made looked similar to everyone else’s. 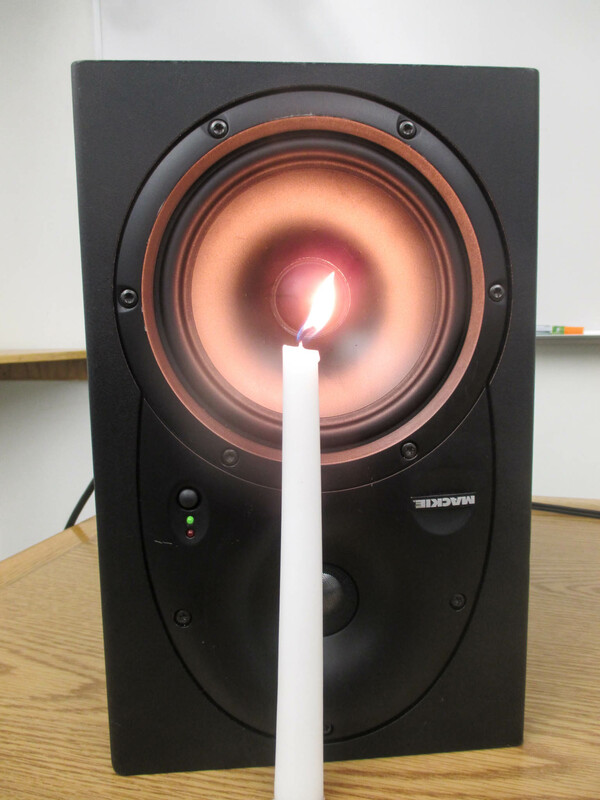 Figure 4: A loudspeaker driven at a frequency of 40 Hz was used to first make a candle flame flicker and then blow out as the loudness was increased to demonstrate the power of sound traveling as a pressure wave in the air. 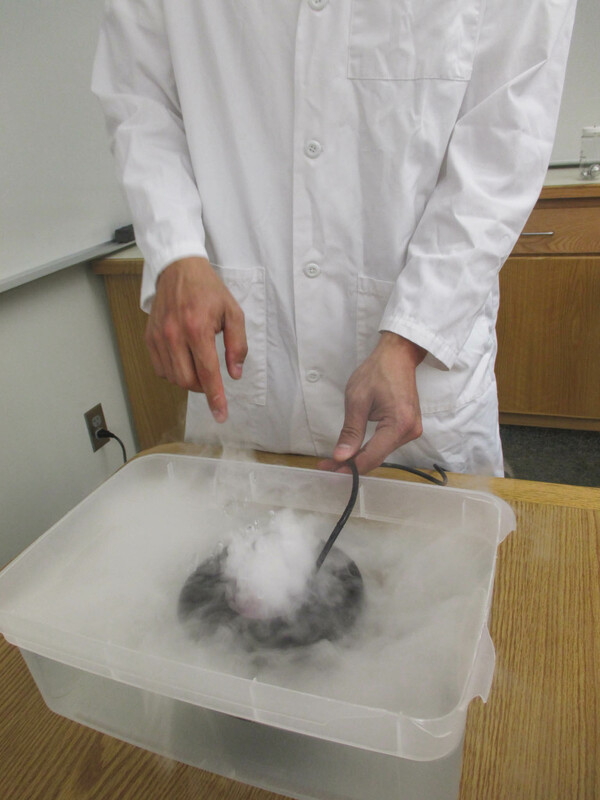 Figure 5: A surface vibration loudspeaker placed on a table was another effective demonstration for the students to feel the sound. Students felt the sound as the surface vibration loudspeaker was placed on a table. Some students placed the surface vibration loudspeaker on their heads for an even more personal experience with sound. Figure 6: Pond foggers use high frequency and high amplitude sound to turn water into fog, or cold water vapor. 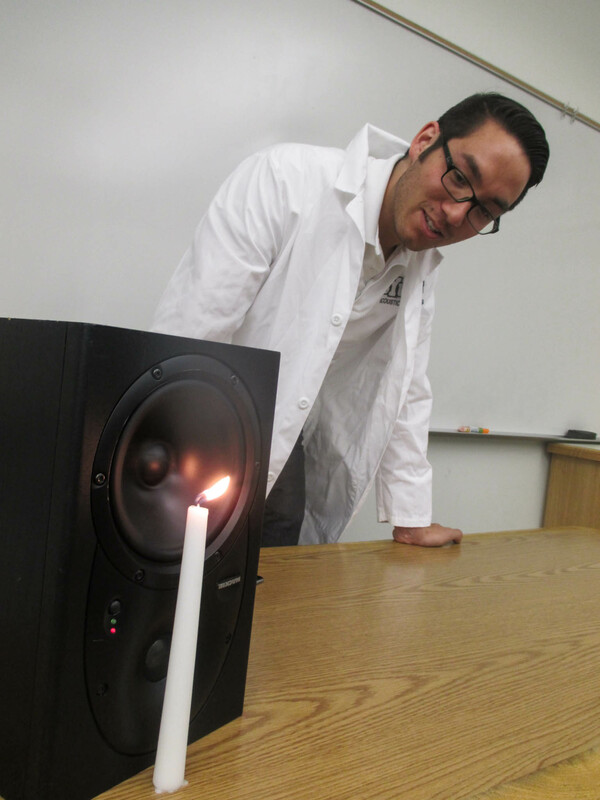 This demonstration gave students the opportunity to see and feel how powerful sound or vibrations can be. They could also put their fingers close to the fogger and feel the vibrations in the water. Michael S. Beauchamp, “See me, hear me, touch me: Multisensory integration in lateral occipital-temporal cortex,” Cognitive Neuroscience: Current Opinion in Neurobiology 15, 145-153 (2005). N. A. Scheetz, Deaf Education in the 21st Century: Topics and Trends (Pearson, Boston, 2012) pp. 152-62. Cameron T. Vongsawad, Tracianne B. Neilsen, and Kent L. Gee, “Development of educational stations for Acoustical Society of America outreach,” Proc. Mtgs. Acoust. 20, 025003 (2014). Harry G. Lang, “Teaching Physics to the Deaf,” Phys. Teach. 11, 527 (September 1973). Harry, G. Lang, “Acoustics for deaf physics students,” Phys. Teach. 11, 248 (April 1981).